Charley Harper needlepoint is adapted from the iconic art of Charley Harper (1922 - 2007), the famous American artist and illustrator. His artwork lives on in books, textiles, and now in needlepoint. These designs are easy to stitch and make wonderful framed pieces of art or needlepoint pillows. 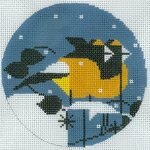 Each Charley Harper needlepoint canvas has been expertly handpainted by professional needlepoint painters. The design is hand painted onto 18 mesh Mono Zweigart needlepoint canvas. The needlepoint design is 5" in diameter. This Charley Harper needlepoint is sold canvas-only or as a kit. We use DMC embroidery floss if cotton is selected, Bella Lusso for wool and Pepper Pot for silk. If you are purchasing stretcher bars we recommend two pair of 9" and some thumb tacks. 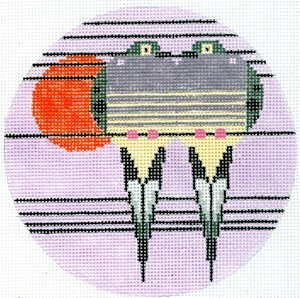 Lovey Dovey Charley Harper needlepoint canvas usually ships within 10 days. However, due to the popularity of Charley Harper canvases it is subject to back order so if you're in a hurry let us know.